Dioxins are a group of chemically-related compounds that are persistent environmental pollutants (POPs). In late 2008, Ireland recalled many tons of pork meat and pork products when up to 200 times the safe limit of dioxins were detected in samples of pork.In 1999, high levels of dioxins were found in poultry and eggs from Belgium. Subsequently, dioxin-contaminated animal-based food (poultry, eggs, pork) were detected in several other countries. The cause was traced to animal feed contaminated with illegally disposed PCB-based waste industrial oil. As indicated through the examples listed above, contaminated animal feed is often the root-cause of food contamination. Therefore, protecting the food supply is critical. Good controls and practices during primary production, processing, distribution and sale are all essential in the production of safe food. 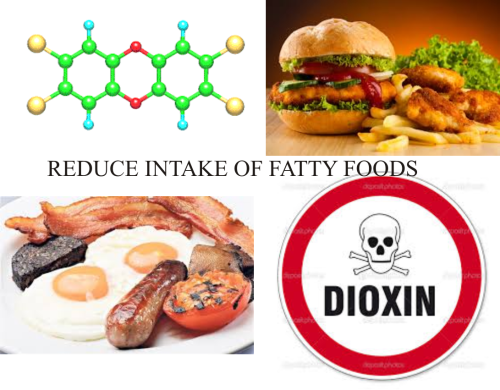 Trimming fat from meat and consuming low fat dairy products may decrease the exposure to dioxin compounds. Also, a balanced diet (including adequate amounts of fruits, vegetables and cereals) will help to avoid excessive exposure from a single source.